Createspace Independent Publishing Platform, 9781477506738, 360pp. "If the dead spoke to you, would you listen?" "Or would you close your senses, tune out the whispers, pretend you couldn't hear." "Find me . . ."
Lost Girl - Readers' Favorite Book Award Finalist in Paranormal Fiction. "Secrets can eat you up from the inside out, no matter what end of them you're on . . ."
Renowned sculptor Allison Weathers doesn't believe in ghosts. But when a tragic twist of fate leads her to the small mountain town of Dawson Mills, Tennessee, she soon learns that the dead don't always stay silent. Shadows begin to shift in the rambling, old Victorian farmhouse she's purchased. Voices come from nowhere. She can feel the eyes on her. Cold. Wicked. Paul Bradford, a contractor who is bidding the renovation work on the house, believes it's more than just Allison's imagination conjuring up the paranormal activity. Toni Harper, a reporter for the local paper, concurs. She's heard snippets of hand-over-the-mouth gossip from some of the town's deputies who responded to calls in the middle of the night. "Ghosts." Or so the former owner claimed in the few months before his death. The secrets they unearth rock Allison right down to the core-a nightmare that's just beginning. Thrust into a haunted world where the paranormal and evil collide, she has one hope of survival: unravel the sinister history buried for decades within the old farmhouse, and find the link to a muddled piece of her past. 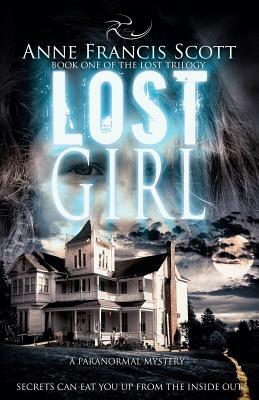 "Lost Girl" by Anne Francis Scott is a paranormal mystery/ghost story with chilling scenes at the fringe of horror. It is the first book in the Lost Trilogy. Paranormal Mystery Author Anne Francis Scott lives in the wooded hills of Tennessee with her husband and two dogs, a short drive from the Smoky Mountains where her paranormal mysteries take place. Home is a log cabin she and her husband built on four acres. She spends a good part of her days up in the loft with her characters, sometimes getting distracted by a squirrel that hops down from a tree to use the deck railing as a highway. Her background is in music and production. For a while, she worked as a sound recording engineer, and later, on the business end of things, as Financial Controller for Capricorn Records. But she has always enjoyed telling stories about things that go bump in the night, a passion that began one long-ago Halloween around a campfire. She's been hooked ever since. Anne is a member of Sisters in Crime and Romance Writers of America. She donates copies of her books to the county and the local library, and her first paranormal mystery novel, Lost Girl, was converted to Braille for the visually impaired. She uses music to jump-start her muse, anything from rock to classical, depending on her mood, and she LOVES spending time with her family. She always appreciates hearing from readers. You can reach her at anne@annefrancisscott.com.